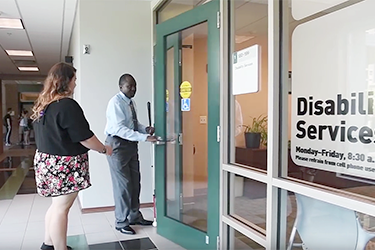 For students who have quick or urgent questions, we now offer daily walk-in hours*, during which students can meet with an Office of Disability Services (ODS) staff member for an individual walk-in meeting, up to 15 minutes long. Students who stop by the office at times outside of the walk-in hours schedule will be advised to either make an appointment or return to ODS during drop-in hours or to schedule an appointment. Test Proctoring: questions, sign up for exams, etc. If your question/concern is not on the lists above, please schedule an appointment with your counselor or the staff member who coordinates the specialty support services you’re requesting. Appointments with case managers and other ODS staff are scheduled for thirty minutes. Pre-service interviews, information sessions, and psychoeducational intake appointments are scheduled for one hour. You can always email your counselor or appropriate staff member your question and they will respond at their earliest convenience. *Please note the posted walk-in hours are contingent upon the availability of ODS staff and apply only to the Fall and Spring semesters. In the case of inclement weather, it is best to contact ODS to inquire as to the availability of walk-in hours for that day.